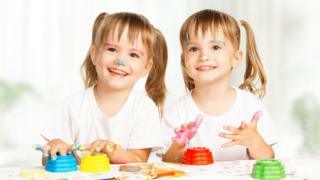 Should twins be taught separately? Should twins automatically be put in different classes at school? New research suggests not. A study from Goldsmiths, University of London, finds no strong evidence that putting twins into different classes at school is better for them academically. And this is the case for both identical and non-identical twins. It says there should be no strict rules on separating twins, and it should be left to the youngsters, their parents and teachers to decide what is best. The researchers analysed data from more than 9,000 pairs of twins aged between seven and 16 in schools in the UK and Canada. They found that, on average, separating them had no substantial positive or negative effect on the twins’ academic achievement, cognitive ability and motivation. Researchers examined twins’ academic achievement, based on teacher reports and exam results, as well as their cognitive abilities and academic motivation. The study says: “Our results show almost no sizeable positive or negative average effect of classroom separation on twins’ achievement, cognitive ability and motivation. “These results suggest that in terms of academic achievement, cognitive ability and motivation, policymakers should not impose rigid guidelines for schools and parents to separate twin pairs during their education. The results were similar across ages and countries, and among both sexes and both identical and non-identical twins. The study adds that, among the UK twins, the only significant differences between twins taught together and separately was at the age of 16, with a “weak average effect” in favour of educating twins together. Yulia Kovas, professor of genetics and psychology at Goldsmiths and lead author of the study, said: “We are not saying that separation has no effect on the children involved but rather that there is no strong evidence to justify a rigid rule that twins should be taught separately – or taught together – because it is better for their academic studies. The research findings are published in Developmental Psychology.